Still concerned about using a deer feeder? Worried that it will attract the wrong types of animals? It’s a good idea to do a bit of research and understand the specifics of deer feeding before getting started. There are a few common misconceptions and fears about deer feeding that people have. The information included in this article will hopefully provide the needed answers and set the record straight. A Deer Feeder has to be Placed in the Garden – Wrong! One of the common misconceptions is that you have to place the deer feeder inside your yard to control the food intake and put more food inside. This is a completely wrong belief. The market features a number of products that are perfect for remote use. Automatic deer feeders can be installed just about anywhere. They have a timer and a precise mechanism that both control the number of times and the quantities of food that are released throughout the day. Many of the automatic deer feeders feature a solar panel. Thus, they recharge themselves during the day. This type of feeder doesn’t necessitate a source of energy and it can be installed up in the mountain. All that you’ll have to do is add some more food inside the feeder periodically. Some people start believing that the feeder is ineffective after a few days of use. The food will remain untouched inside and no activity will be observed. Deer are cautious creatures by nature. They tend to distrust anything new that appears in their habitat. Thus, they’ll need some time and some courage to approach the feeder and explore it. Once deer feel comfortable with it, they’ll start consuming the feed. There’s one more thing to keep in mind – deer are most active early in the morning and in the evening. Thus, you’re not likely to observe any activity during the day. If you’d like to see the deer eating their food, you may consider getting up early in the morning and observing the feeder from a distance. Some people worry that the food placed inside the deer feeder will either be consumed by the wrong creatures or it will be exposed to the elements. As a result, these individuals fear that the food will go to waste. Most deer feeders are designed to have a closed design. This means that the food inside will be protected from moisture and rain. The opening are usually positioned underneath the container, allowing the deer to have a snack without exposing too much of the food. The height and the design of the feeder can also prevent other animals from consuming everything. 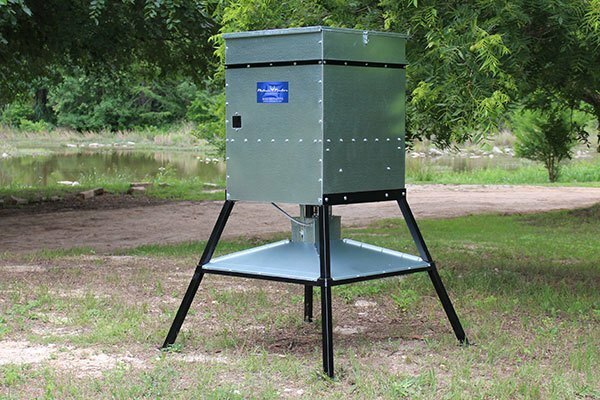 When it comes to choosing a deer feeder, you’ll have to take a look at its shape and the safety features. Take some time to acquaint yourself with the different models and to understand their characteristics. Research suggests that as they grow older, deer are more likely to remain within the same area. Site fidelity will increase, especially if the animals have favorable living conditions. It’s not true that after installing a feeder, you’ll see the occasional deer every other month. Animals that feel secure and that are given access to food will keep on returning. You may not see them, if the deer come early in the morning but chances are that they’ll be there. Thus, you can use a deer feeder to create a safe space for these magnificent creatures. By using a feeder, you can protect deer from hunters and predators. With time, they will begin spending bigger portions of the day in your yard. Chances are that they’ll either grow somewhat comfortable with human presence. Having a deer feeder in your garden or the nearby forest is certainly a great idea. Deer and fawns are gentle creatures. There’s no reason to worry about their presence or fear them. The use of feeders will also be quite educational for your kids and teach them valuable lessons about nature and the connection that it has to human beings.